The remarkable thing about this book is the way in which the author has approached such an expansive and multi faceted subject. And that’s just in reference to Henry Ford as a person! Add to this already complex individual some very radical ideas concerning Industry and you can easily get lost! But Mr. Grandin doesn’t get lost at all. 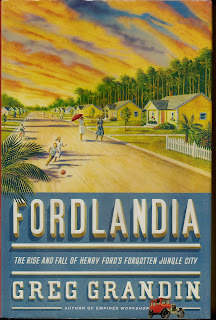 He leads the reader on a carefully laid out journey from the Ford plant in Michigan to the jungles of Brazil. In the 1920’s, as America prospered, teetering towards the Great Depression, Henry Ford released his newest creation, the Model “A” Ford. With it's varied colors and other added features it was quite a departure from the earlier Model “T”. Available to almost every American in those days of easy credit it became a mainstay of the newly emerging road trips that ever more Americans were discovering. Fords factory techniques of mass production and his progressive wage of $5 a day were legendary. The mass production allowed for greater profit for the owner and greater wages for the working man. But this all came with a price. Time management experts followed the worker, recording his every move, constantly looking to increase productivity and profits. At this same time Mr. Ford was privately engaged in many pursuits. From soybeans as a “do all” product encompassing plastics, food, fibers and a myriad of liquid solvents, to lobbying for new regional currencies based on hydro electric outputs, Mr. Ford was a very busy, thinking man. And he expected as much from his employees as well. He was also engaged in newspaper publishing with his own, decidedly Anti-Semitic newspaper. But his real passion was to create a rubber producing state in the Brazilian rain forests. With a need for tires on his automobiles he was intent on carving out an empire in the jungle. He envisioned bringing American middle class life to the indigenous people of Brazil. This was a fantastic undertaking,fraught with peril. He established “Fordlandia”, as it came to be known, along the banks of the Tapajos River, a tributary of the Amazon River which flows to the Atlantic Ocean. He was intent on cutting out the middle man and again, increasing profits. The way things turned out, or didn’t, make for quite a read! How do you teach an indigenous people factory style rules? And how do you justify trying to regulate the lives of these people? Is their compliance really voluntary, or is it self imposed slavery? Great questions that are all posed within this book. There are some interesting tid bits as well. For instance,the first "in flight movie" was shown on a Ford Tri Motor Airplane. It was a Harold Lloyd comedy about the last horse drawn streetcar in New York City. That the author manages to take the reader on such a complex trip through the jungles of the Amazon, as well as the corporate boardrooms of Detroit, in such a coherent manner is a tribute to his ability as a writer.